totally awesome coat! and the perfect color to brighten up sad, grey Winter Days! Thanks, Joelle! My first impulse is always towards grey, but I’m glad I didn’t do that this time around. I love it! Well done 🙂 Colors are wonderful! Love the color. Re: snagging…if you don’t already have a snag repair tool, it’s worth the (small) investment. It looks like a turning tool only it’s the size of a seam ripper, and it fixes snags in a jiffy. Ahh thank you! I have never heard of that, so I’m excited to try one out! You. Amaze. Congratulations for your stick-to-it-iveness. Also, it struck me that this was one of those great projects where you use absolutely every skill you have accumulated for sewing, and then had to learn about 10 more. Those are the most rewarding kinds of projects. And it looks great! Thank you, Nicole! You’re so right- it’s always nice to get to the end of a project like this and realize that, even though it was scary, you’ve done it and the next time you do it, it will be easier and more approachable! Hooray for learning! Love the coat, its color ànd the post, makes me want to make it myself right away! I really like your coat; it looks great. 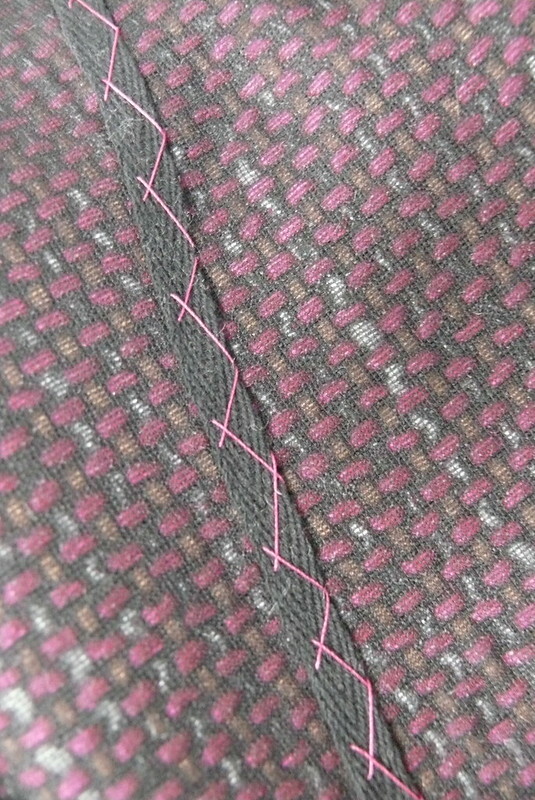 I understand the impulse towards that raspberry fabric–it’s lovely & the lining makes me want to squeal with delight. However, I *love* the story of making your coat. Some days I want to read substantial posts that teach me something about sewing. Other days I want inspirational fun. This post was both & is wonderfully well written! The narrative is so engaging that the technical aspects of the process are still absorbing. 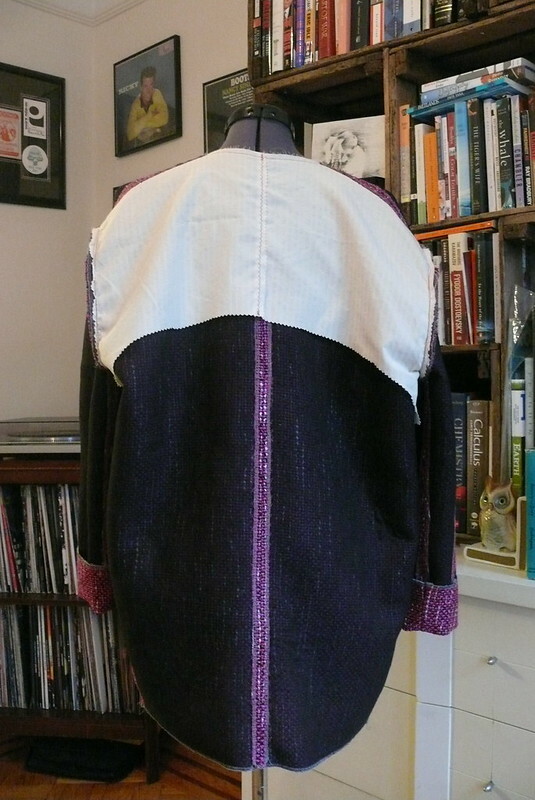 I love your honesty about the challenges of making this coat–it adds to the dramatic tension in the story, but it also resonates with my experiences in making things. It’s inspirational: perseverance and good-enough leads to a beautiful coat (while perfectionism-my issue-is a dead end with no reward). Also, thanks for the many links to tutorials throughout. Thank you, teaweed! Perfectionism is such a struggle, isn’t it? I always find it difficult to find a balance between knowing when you can and should do a little better, and when you’re just being too picky. Sometimes we are just so hard on ourselves! When I’m teaching a sewing lesson, I always tell people that we wouldn’t expect to sit down at a piano for the first time and bang out Tchaikovsky, so I’m not sure why we expect precision and perfection when we’re trying out new sewing techniques! It can really choke the joy out of making things. Oh yay, I hope this helps, and I hope you make it! It will look so cool on you!!! your coat is nice and thank you so much for mentioning the issues with the pattern. yay!!!! i am so glad it is a happy coat. how can you not be happy in a cloud of fuchsia in new york city? and quilted linings RULE. i’m just saying. Wowww so beautiful and colorful ! Thank you! I’m pretty smitten with the bright color! I really hope the post helps someone! It was hard to find all the info I was looking for, and while I have a good book on tailoring, it was almost too much information and became kind of overwhelming! The Gingers are a massive endeavour! They take time to put together! Good luck!!! Love it! The lining print together with the boucle is fantastic. 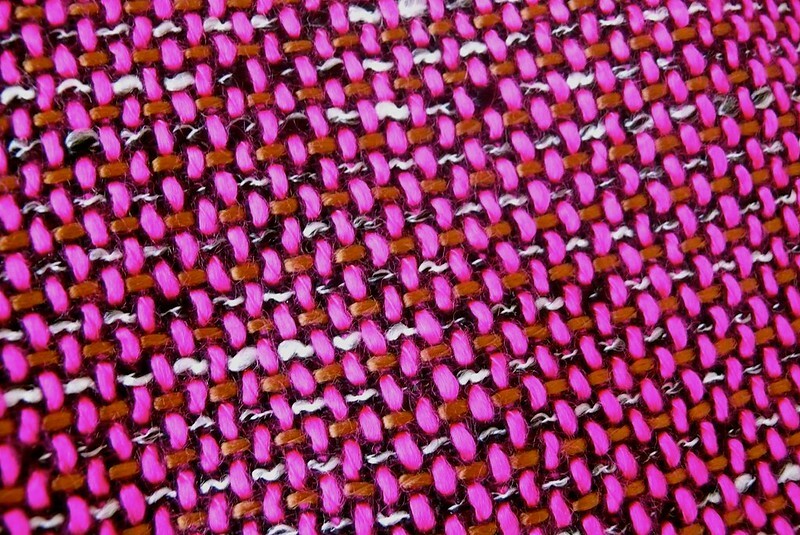 Look at you go with your herringbone stitch! Super cute coat. I have not tackled a coat yet. I’m afraid….also, I find that I’m into quick makes and when I tackle something that takes time, I get sidetracked and want to sew a quick sew while doing the big project. And by big project I mean something in a woven. Ha! My time sewing is limited due to work, kid, hubby, etc so I’ve found that knits are the way to go for me for now. Great job with the coat and thanks for posting, it’s a nice color and makes me smile, hope it does you too! There’s nothing wrong with that at all! I don’t know how anyone with kids gets ANYTHING done, let alone sewing! And knits are so quick to sew and so hard-wearing! Gotta love ’em! That is darling! The colors are awesome and I love the lining! I definitely need a new coat in my wardrobe, but I’m up to my ears in holiday decor and gift sewing! Just one more week and then I can focus on other projects! Thanks, Anna! Good luck with all your holiday sewing- it’s so hard to sew on a deadline! I think the sizing looks good on you, and a size up may have look un-intentionally big, but I know what you mean about choosing how ‘slouchy’. It looks like a great jacket and the simple shape works well with the bright boucle. high five! It’s so hard to decide on ease! 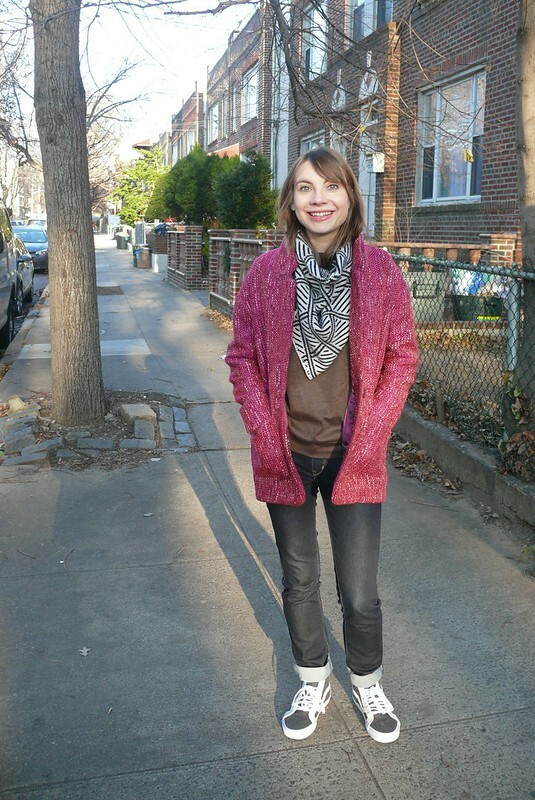 You’re probably right… I might have looked like I was borrowing my granddad’s coat! Wow, that’s a gorgeous coat! Sounds like a labor of love, and totally worth it. Great choice on the lining, it’s perfect! I wish I was making a coat this winter, but today I’m rushing to finish a tote for my uncle who ordered it last night as a Christmas gift. Yikes, I hope it gets there in time! Eek! Hope you got it done! Nothing like a last-minute gift to fray your nerves! Fabulous coat, and the lining is perfection! I hope you continue to enjoy this awesome garment for a long time. Dude, that coat is a knock-out! Wowzers! You have much more discipline than I do to take all of those steps to assemble together the PDF pattern, but all of your hard work definitely paid off. Bravo! I was in it too deep to back out! 🙂 That’s the only reason I ever get anything done, ha! Dang lady, you put a lot of work into that coat! It looks great, and I love the lining you chose. Thanks, Marrie! It was a lot of work, but it was actually pretty enjoyable… once I had everything fused, hahaha! Love it! If I can get myself motivated in the next few days, I plan to make myself a fuchsia Christmas dress. Bright colors are the best and bright outwear always makes people smile! =) The lining fabric is so fun! Great job on all the details – definitely something you can be proud of and should last far longer! As for the snagging, it’s just the nature of boucle and tweed. Get a “knit-picker” (it’s a little hook that looks like a seam ripper on the notions wall) and hope for the best. I think you subconsciously like to live dangerously, which is why you didn’t make a mockup, hehe. Ooh, I hope you have time! Fuchsia would be a great color on you!!! Dude, there’s totally some truth there. Livin’ on the edge! Beautiful coat! I love that boucle and the lining, perfect together. I love seeing all the steps that went into making it. 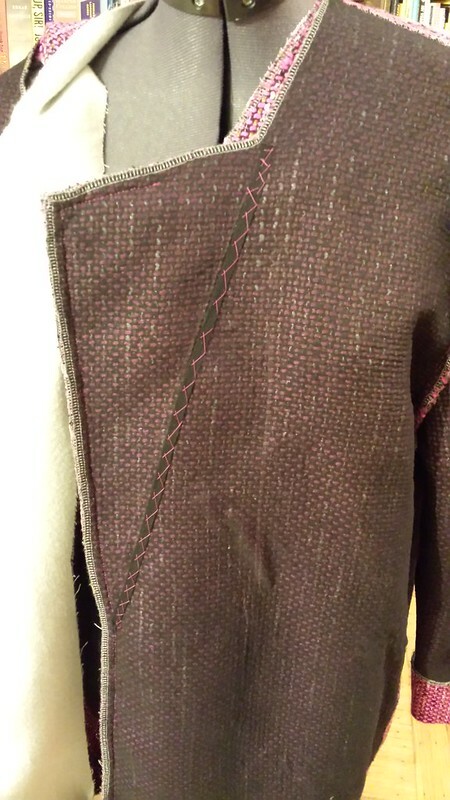 I just sewed up a quilted tweed dress and had to go through a similar process, the serging took forever! Wow, a quilted tweed dress?!?! How awesome!!!!! I love it! You are a true sewing rock star! Awesome – the lining, the outer fabric, the construction – everything! Congrats on completing the coat! I’m in the middle of a project (lined trousers) that I have similar feelings about. I want them to come out really well, and I keep hesitating over various steps. I’m making progress though! Thanks for sharing your process! You certainly needed skill and dedication for this one, and the results show it all off. Thanks, Tasha! Good luck with your trousers- that really seems like a complicated project. It’s hard to keep going when you’re not super confident about the next step, but I know you can do it! Oh my god, that’s amazing! So much careful work and it looks AWESOME. I’m pattern testing a trouser pattern and have to sew up the new Thread Theory Camas Blouse. Since we just moved there’s not a lot of holiday stuff going on so I’m getting a head start on summer sewing. Whoa, you’ve got a lot going on! The Camas Blouse is really pretty… I’m looking forward to your version! Wow, I am tired just reading about everything you had to do to finish this coat. Amazing job, Sonja, it looks incredible and I love that color on you. Way to knock it out of the park on this garment. Thank you so much, Lori! You’re too kind! Thanks girl! Thanks for linking to that helpful video, and for inspiring me with your awesome jacket! Thanks, Chris! I just went to your blog to try to find the duffle, and wow, you’ve made some amazing coats! I’m so impressed! Is it crazy that I’m considering sewing up the Yona as well? 😀 It’s basically my dream coat… if it had come out before the Gerard, I definitely would have bought it first! Raglan sleeves FTW! Fabulous coat! I’m crazy about this silhouette since I made one for myself. Now I need another in brighter color like this one! Your plaid coat kills me! It’s so good!!!!! love your version!!! ive been reaaaaally considering the gerald pattern so i am glad to hear your review. your coat it beautiful so its worth the trouble! Ahhh, good luck and happy sewing! It’s definitely doable and it’s such a fun style that it’s totally worth it! I am completely in love with your pink coat!! So worth the hard work. 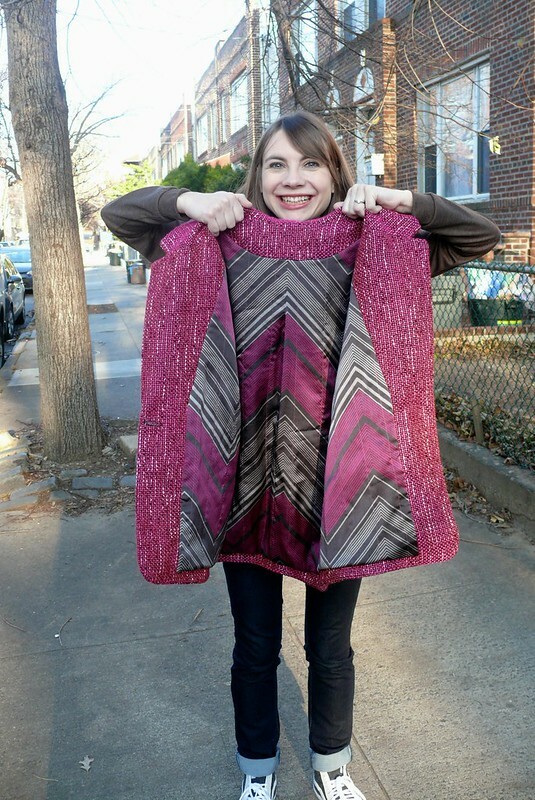 I totally feel ya on how involved and overwhelming these outerwear projects can be. I felt the exact same way with the (also pink!) blazer I did recently. The quilted lining is a fantastic idea. It must feel so luxe! I can’t wait to see modeled pics of your blazer!!!!! It’s been such a process, and I’m so glad that you’re happy with it! 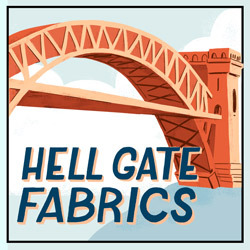 Sound like epic sewing – with a great result, it really suits you! Shame the English version does match the French version – and that PDF sounds like a right pain. Good on you to have push through! What a fabulous coat – and totally suits you! The silhouette and colour are great. Love that lining too. All your hours of work definitely paid off! I’m kinda jealous of your cold actually. Even though I have never had a cold Christmas it just doesn’t feel Chrismassy when it is stupidly hot! Very pretty coat! You’re looking so very great in it. The fabric is divine too. I know what you mean, about the moment that those imperfections turn out to be nothing after all. That is the sign of a great job. Bringing color to the NYC streets. Well done! It looks awesome. Wow! Such a lot of work! I’m super impressed. Seeing all of your extras inside really adds to the story and what a major investment in time and coffee this must have been. Wow. Again. It’s fab. Totally worth it. I’m glad it makes you happy. I’m sure you bring cheer to everyone when you’re out and about wearing fuschia! Holy monkeys hats. Wow! Sonja, I seriously can’t believe how fierce you sewing technique, knowledge and skills have become. I am in awe (and inspired!) Epic work, lovely! Ahhh, thanks, Amanda! Now show us your new blazer!!!!! Ooh, I would love to see your take on outerwear! I know it would be amazing! Great coat! I love the fabric has a bit of neon to it. It fits you great! I just finished my coat too in camel wool. Now I’m sewing another Grainline archer shirt, and this will be my 3rd one! Ahhh, you’re addicted to Archers now! They’re really lovely, aren’t they? And fun to sew! I’m going to pop over now and look at your coat! still loving this coat! that boucle is the stuff dreams are made of! i love the up-close shot where you can really see how neon-y that pink is! it’s amazing how all the colors blend to a really flattering fuchsia when all together. and you did such an amazing job on the construction! whew!! i get exhausted just THINKING about catchstiching SA’s and taping roll lines and quilting linings…. but the results are so SO worth it. i really need to remember this the next time i’m tempted to take the easy way out! I haven’t always loved boucles because the bright colors sometimes blend into something that’s kind of muddy and dull when you look at it further away, not my style at all! But this fabric is pretty far away and a fun surprise when you get close to it! I had a hard time wrapping my mind around what needs to happen for the notched collar, but once I understood, it was easy to execute. Good luck with yours! It really isn’t that bad… you can do it! I had the worst time sewing mine. I made it in the thickest corduroy which was……awful!!!! What happened for me is the lining just doesn’t fit. I couldn’t figure it out. So, it’s a fail because the lining got bunch with the buttonholes. I’m going to work on it again to figure out another way to do it because I like it. Sort of…. I’m so glad you made yours because you have the most explicit instructions I can find!!! Thank you. Ahhh, man, I’m sorry, that sounds really annoying. 😦 I hope you’re able to make it work! 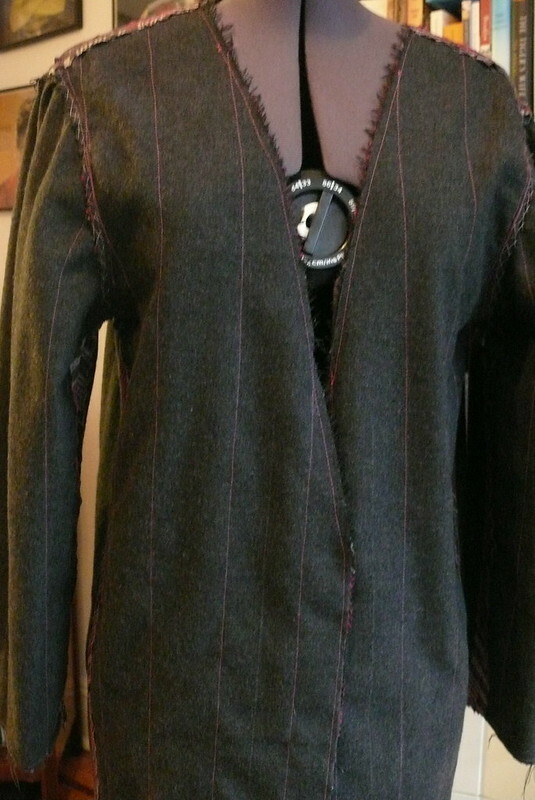 Corduroy will be nice to wear once you’re done sewing it! I actually thought of you when I saw this boucle! They didn’t have any other colorways, though, and for some reason I thought you preferred blues/greens/purples to pinks, although I should have just emailed you right away. I’m sorry!! !